I love this time of year with all the holidays...so many things to love about it. But as my kids get just a little bit older, I am discovering something else to love about this time of year...it provides great opportunities for teaching thankfulness, giving, and compassion. Not that you can't teach those things at other times of the year, but there are just so many built-in activities around the holidays already. For example...giving food/canned goods for Thanksgiving, Operation Christmas Child, Angel Trees, etc. So this year, I decided to start a Thanksgiving tradition in our house...the Thankful Tree. Thanks to Pinterest for the inspiration, of course. There's nothing like Pinterest to get me in a crafty mood. 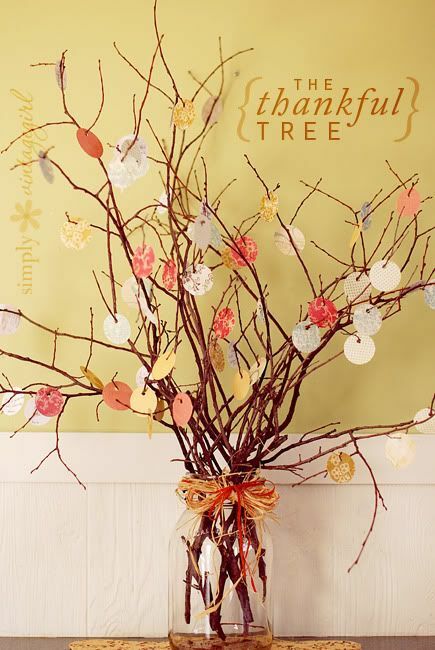 I saw this Thankful Tree (by Simply Vintage Girl) a while ago, but didn't pin it right then. But yesterday, it popped into my head again and I just knew I needed to do it this year. Ethan is now at an age where he is able to think about and articulate things he is thankful for. And it is just as good an exercize for me and Casey too. This morning, Ethan and I dug out a vase from the cabinet above the refrigerator (otherwise known as the place where I store things I don't want to get rid of but never use.) 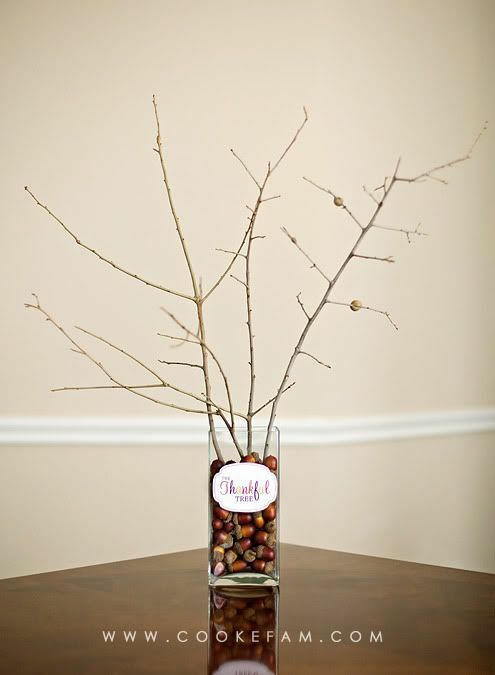 We filled it with some acorn vase fillers that I already had. I made a sign for the vase in Photoshop and attached it using painter's tape. Then, Ethan and I headed out to our front yard while Logan was taking his morning nap, and we found a few branches that would work perfectly for our tree. 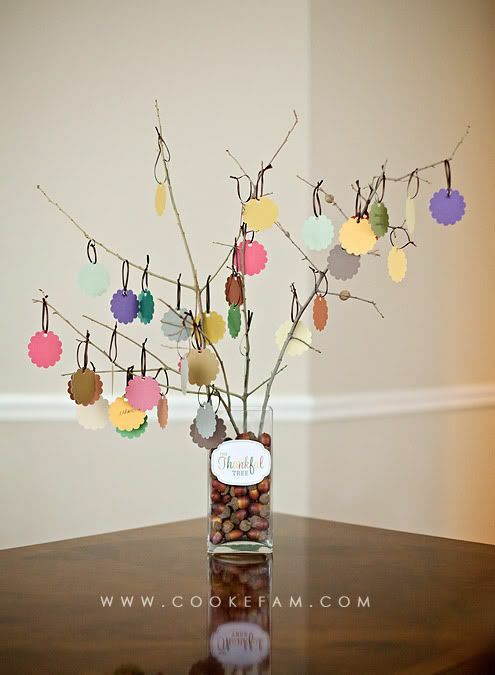 I used a scallop punch to make the "leaves" for the tree. I used that shape for no other reason except that I had the scallop punch already and that makes the job super-easy instead of cutting out each shape. I punched holes and threaded ribbon that I had in my stash. So, this project cost me $0 total. 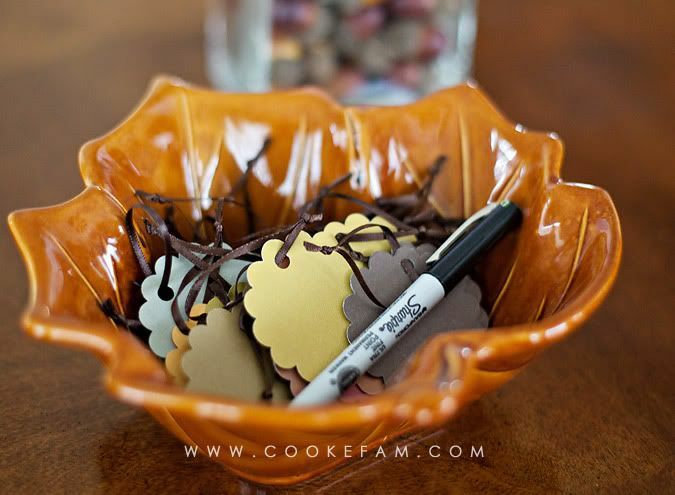 This year, we're going to add two leaves per day with things written on them that we are thankful for. Ethan will get one leaf per day and Casey and I will share the other one and take turns coming up with things. In the future we will add Logan, of course...you know, when he can talk. And we might get to where we each add a leaf a day. Casey came up with the idea of writing on the leaves and hanging them on the tree at breakfast each day. This way, we can start out our day with being thankful and we can talk about it together over breakfast. I keep the leaves and the pen in a leaf dish right by our Thankful Tree, which is smack in the middle of our kitchen. That means we will see it approximately 1000 times a day or more, which is exactly the idea. 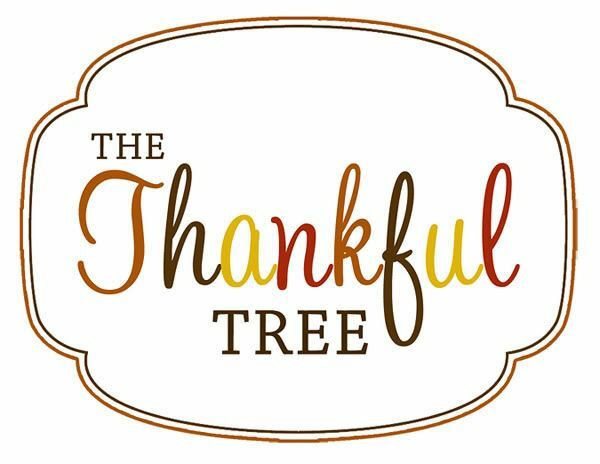 If you want to make a Thankful Tree of your own and want to use my label, you can download it by clicking on the image below (after the page loads, select "file" on the far left and click "download original."). This has also been added to the free printables page. Wonderful! I am anxious to see what Ethan is thankful for? Probably his cars and backyardians! I'm thankful for your craftiness and your desire to make family traditions too! Love it! We will be implementing this in our house this weekend as well. Thanks for sharing! neat idea! 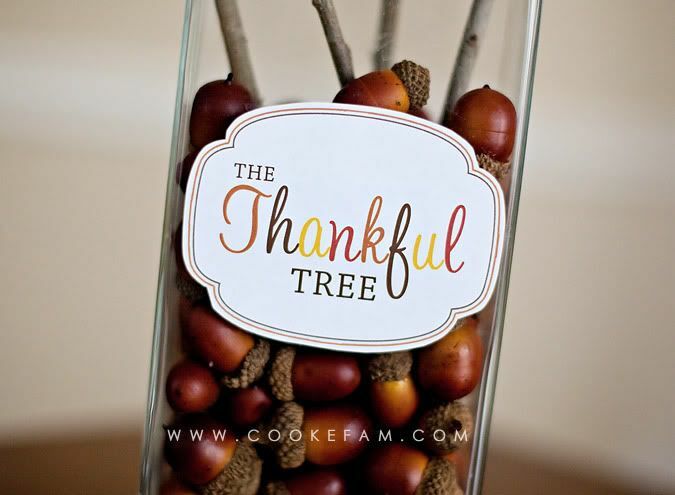 what a great way to remember what you're thankful for this time of year! I saw this on Pinterest, as well, my new obsession (I'm NOT kidding! ), and I love your interpretation of it. Thanks for posting all of your cool printables! I pinned this last year and knew it would be useful later. I am preparing for a Prayer Breakfast and will use it not to hang prayer requests on it but we will put things we are thankful to GOD for. At the end of the gathering we will express our thankfulness to GOD for each in prayer.